Abu Dhabi is a little bit less visited city in UAE than Dubai, but it still offers plenty of hotels to choose from. No matter if you visit Abu Dhabi for business or leisure, you will definitely find what you are looking for. But looking back few decades ago, Abu Dhabi had just few hotels. One of the very first one was also Hilton Abu Dhabi hotel, which still looks impressive today. Hilton Abu Dhabi hotel has one of the best locations in the city. 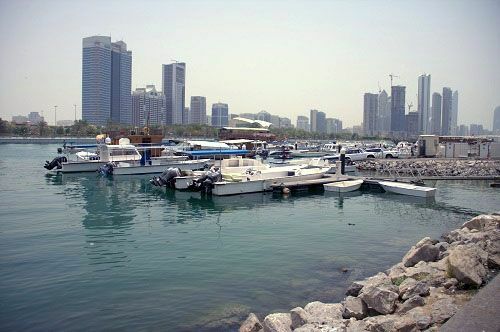 Not only it lies right at the popular Corniche, which is Abu Dhabi’s coastal area, it is also close to all major Abu Dhabi tourist attractions. Staying in the Hilton Abu Dhabi hotel, you will be able to visit the impressive Sheikh Zayed Grand Mosque in about 15 minutes. Adding few more minutes, you will reach the Yas Island and the popular Ferrari World theme park. If you are interested in a more local throb, fish market, vegetables market, port and the Heritage Village are in the vicinity as well. No matter if you are staying in Hilton Abu Dhabi hotel for business or pleasure, you will definitely like the fact, that the international Abu Dhabi airport is just 25 minutes drive away. Even though the Hilton Abu Dhabi hotel is one of the oldest hotels, it still looks up-to-date and modern. After all, we should not expect anything less from a 5 star hotel. There are 327 rooms in the Hilton Abu Dhabi hotel, which are all pretty large and comfortable. If you cannot spend a day without tea or coffee, there’s also a free daily stock with a water heater available. 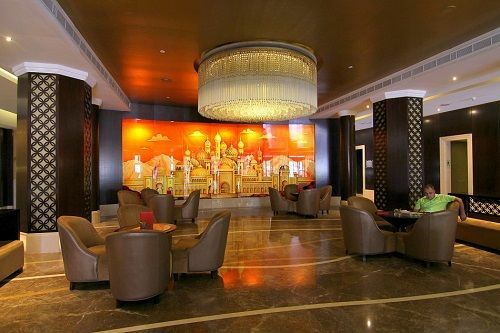 Hilton Abu Dhabi hotel is perfect for foodies, as it offers 15 different restaurants and bars. 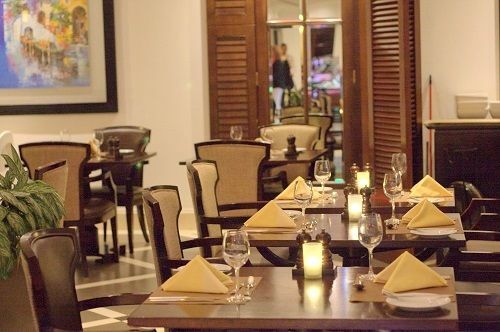 There is absolutely no doubt, you will find something tasty for yourself here. We’d recommend their half board, as this is a great way to get different tastes on your plate. 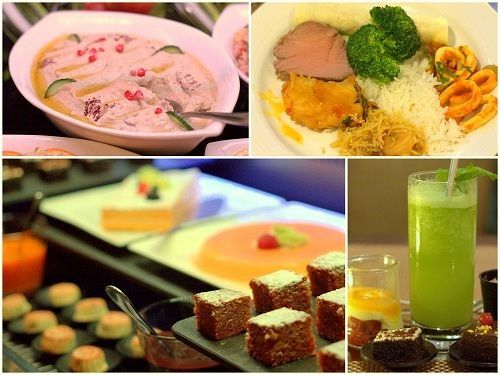 A large buffet dinner offers world’s cuisine dishes and it’s completely up to you what to choose from – Arabic, Asian, Italian. Due to our early morning flight we were unfortunate to miss out its breakfast, but pleased when found out that the Hilton Abu Dhabi hotel takes good care of all early morning risers as well – you can treat yourself with a free tea, coffee and pastry on a cart in the lobby. During the day, you can refresh yourself with different types of juice as well. 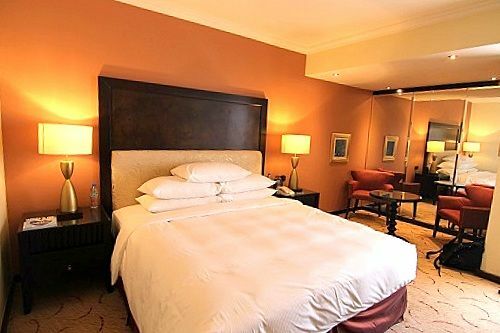 Hilton Abu Dhabi hotel is a 5 star luxury hotel, so you should expect also a 5 star treatment and service. Reaching the Hilton Abu Dhabi hotel by your own car, you will definitely like the fact that parking is complimentary. There is also free WI-FI available and large gym for everyone wanting to stay fit. You can even attend some group exercise classes. After a long day of social gathering, congress (up to 2000 people) or maybe sightseeing, some relaxation would be perfect. Head up to its spa or maybe to hotel’s private beach. The beach, which spreads over 11.000 sqm, offers everything to stay refreshed – 3 swimming pools, water sports, bars, restaurant and even kids waterslides. 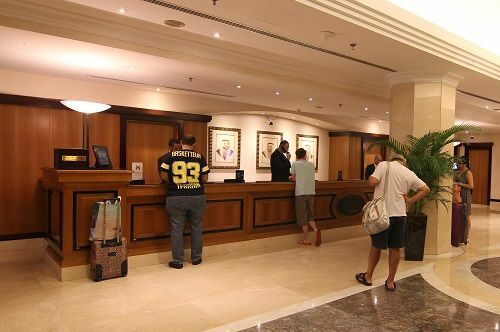 For your pleasant stay Hilton Abu Dhabi hotel employs professional staff, which is always there to help. We also loved the fact that the personnel at the reception was able to answer on our specific tourist questions. 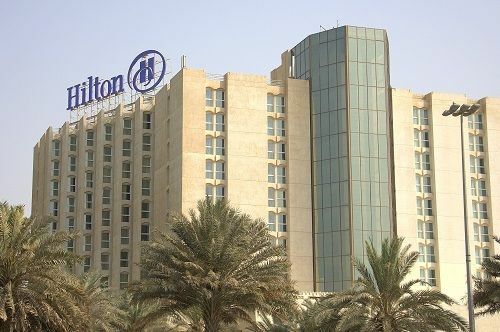 Hilton Abu Dhabi hotel can boast with one of the best locations, 5 stars, long tradition and history, private beach and lots of additional services. 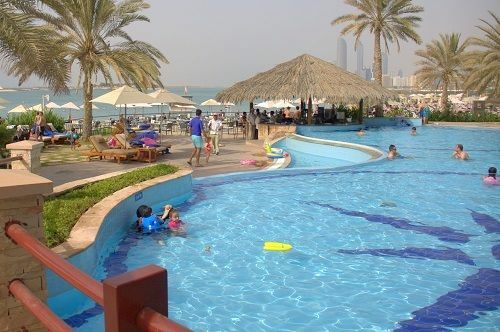 Here in Hilton Abu Dhabi hotel you really get what you pay for and sometimes it is really worth paying a little bit more and enjoy the holidays with a class. If your budget and wishes meet your demand, you can check here. Hilton Abu Dhabi hotel is with no doubt a perfect choice for a luxury stay and for everyone who wants a little bit more than a room, when being on a holiday. Having a large private beach is just icing on the cake. Our stay in Hilton Abu Dhabi hotel was complimentary, but all opinions and recommendations are completely our own. Traveling to Oman or UAE – what to choose?